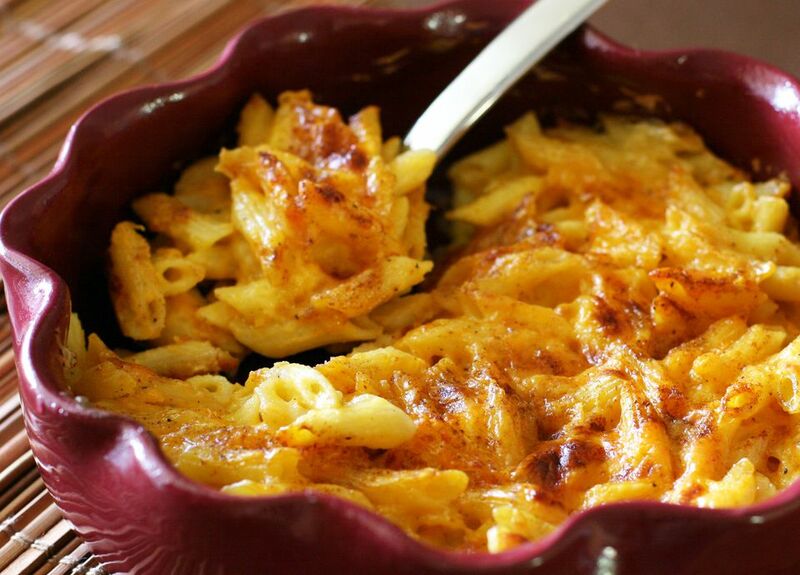 This is a basic baked macaroni and cheese. It's made simply with cooked macaroni or penne pasta, cheese, cream and sour cream, and seasonings. There's no sauce to make, just cook the pasta, mix with the cheese and other ingredients, and bake. Cook pasta in boiling salted water following package directions. Drain in a colander and rinse briefly with hot water. Put the pasta back in the saucepan and add the cheddar and American cheeses, cream, and sour cream. Add the salt and pepper. Stir to blend thoroughly. Sprinkle with paprika and bake for 25 minutes, or until lightly browned. With Bread Crumb Topping: Before putting the casserole in the oven, combine 1 cup of soft, fresh bread crumbs with 2 tablespoons of melted salted butter. Toss to coat the crumbs thoroughly with the butter. Sprinkle the crumbs over the macaroni and cheese and bake as directed, until the crumbs are golden brown and the casserole is bubbling.